The Andes Mountains begin in Colombia with three ranges; the eastern, central, and western or coastal “cordilleras.” They rise from the Caribbean to the snowcapped peaks of the Sierra Nevadas near Santa Marta, separating the Pacific from the “llanos,” or plains, and the land that flanks the Amazon River. This is the second most biodiverse country in the world. It also has the world’s second highest number of displaced people, behind Syria. This is a country of extremes: extreme natural beauty, extreme richness of natural resources, extreme economic inequality, extreme violence. Colombia has been at war for more than half its history. Since the beginning, the struggle has been based on controlling the land and the resources it produces. The geography and the dense jungle have helped to cover the tactics of those who seek control. Medellín is located in the curved Aburrá valley in the northwestern state of Antioquia. When I first visited in 2001, I was taken to the top of a bell tower in a church on the east side of the city. I could see the cars moving on the other side of the valley, and I realized I had the same feeling of intimacy and shared experience as being in an opera house: that of being able to see the expressions of the actors and the others in the audience. There is something beautiful in that experience; it’s also difficult to avoid seeing the realities of the unfolding drama and the reactions it produces. There are two densely forested hills near the center of the city. One is called the “Cerro Nutibara” or Nutibara Hill, on which sits a deteriorated modern sculpture collection and the “Pueblito Paisa,” a comical three-quarter scale version of a typical small town in Antioquia and one of the few tourist attractions in the city. The second hill is the “Cerro Volador” or the “Flyers Hill”; the largest park within the metropolitan area, it is also one of seven surrounding hills that the now-extinct Aburraes Indians — who occupied the land before the Spanish arrived in 1541 — considered to be guardians of the valley. The downtown area where the original town began can be made out from one of several scenic overlooks near the top of Cerro Volador. The difference in size between the central city blocks is striking compared to the surrounding neighborhoods. Gilda Wolf, a local architect, urban planner, and professor at the National University, uses this vantage point to explain the origins of the density changes stemming from community-based organizations in the city. From the grassy opening on the side of the hill, she identifies Barranquilla, one of the main streets that flanks the center of town. Why do they call them “barrios piratas” or pirated barrios? Because they don’t begin with any infrastructure. The owners only planned the location of the streets and the division of the lots. The people occupied the lots and built their houses, then later they got the services. And how did they get the utility services? With their own labor. They got together to install the electricity, they got together to install the sewer, the water, everything. Maria del Rosario Escobar, Medellín’s Secretary of Culture at the time, was worried about the situation described in the article. She believed that these killings were based on adolescent jealousies, perpetrated by adolescents who saw guns as the only way to settle their differences. This problem, coupled with the popularity of the workshops given by C3P’s artists in residence, resulted in Escobar inviting C3P to redesign the Network of Visual Arts, a city-wide art education project for children and young adults. The new proposal employed artistic techniques and practices to help generate reflections about citizenship, as well as one’s relationship to the city and its neighborhoods. Escobar said that she wanted to use her office to help change these dynamics in the city, and C3P wanted to be part of this effort. We designed the pilot project and began to develop a flexible pedagogical model that could be applied in diverse contexts. At the beginning of the class on the peace process, Deibi 4 one of the participants, was resistant and lacked motivation. He said that he was only there because he had to fulfill a requirement for his diploma; at first he refused to participate, but after three meetings he mockingly and disrespectfully began to share his opinions with the group and the workshop leaders. Deibi said he did not believe in any peace process because [in 2008] he lived what had been the peace process with the paramilitaries in his neighborhood, in which they invited young people to falsely register as having been demobilized, in exchange for $200,000 pesos [about $65.00 USD] a month and a place in the SENA 5 to study. After seeing how that deception affected him and the entire neighborhood of Moravia, we realized that the working format should start from understanding the historical facts about the armed conflict in the country and the role of the communication media in the formation of public opinion. We decided to make a timeline of the armed conflict in the country. Each participant would investigate different years and together we built the story of the conflict from 1948 to 2016. In order to increase the veracity of the information to be included in the timeline, we dedicated a session to understanding how we can be deceived by the news and to understanding why we need to verify our sources before forming our opinions. We, the workshop leaders, collected news stories from Actualidad Panamericana, a site known for publishing fake stories. Before telling the group that the stories were all false, we distributed them to teams and instructed them to separate the false ones from the real ones, then share their reflections with the group. Even though all the news was false, most of the participants identified several as being true and even argued their validity based on their work and personal experience. Deibi’s transformation began the moment he recognized that he could be wrong and that his opinion could be manipulated. In the workshop he became more motivated to research, to debate with others, and soon became a leader for his companions. This process galvanized our resolve in using C3P programs to help the public understand the dynamics that have caused the conflict — dynamics that continue to contribute to the injustices and inequality in the city and country at large. 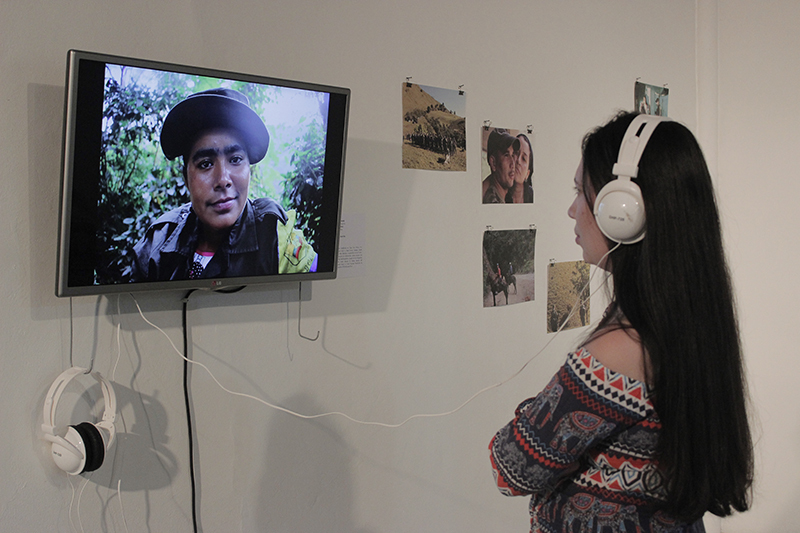 We felt that it was necessary to explore Colombia’s colonial origins; how the commercial exploitation of the land and its people has been the initial and primary motivation for settlement; the implications of class after independence from Spain; and many other conflicts that have been present since Colombia was formed. 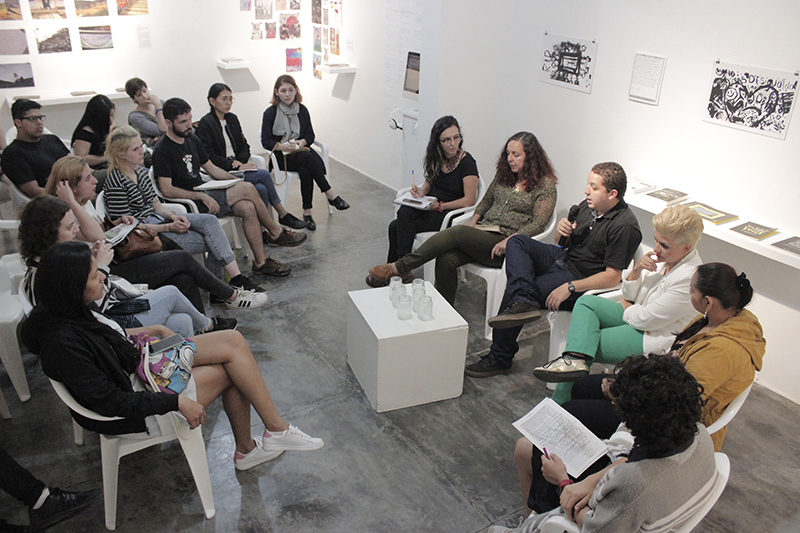 We decided to work under the curatorial theme “New Relationships with Capital” as a way of exploring how the political and social dynamics in Medellín (and the world) could be understood in terms of capital in its broadest interpretations. 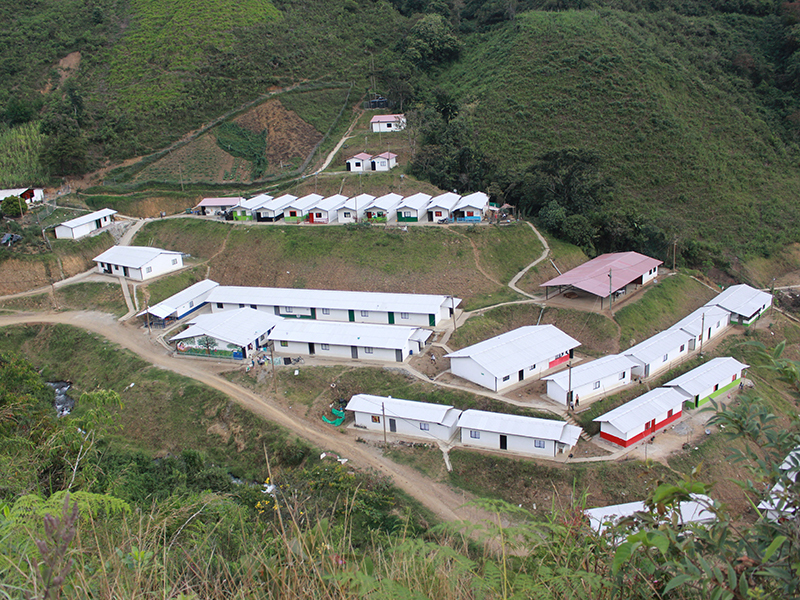 In August 2017, as part of the peace agreement between the FARC rebels and the Colombian government, 10,000 FARC ex-combatants were transferred to twenty-six transient normalization zones, now called Territorial Training and Reintegration Spaces (ETCR is its Spanish acronym). The following April, Ivo Aichenbaum, a young documentary filmmaker, was in residence at C3P in order to produce the third in a series of films about countries in periods of post-conflict. His project was to take place in the ETCR Román Ruíz near the remote village of Santa Lucia about two hours by dirt road from the town of Ituango, which is more than six hours drive from Medellín. The hundred and twenty-five ex-combatants who currently live in this transition zone are now part of the mass of landless peasant farmers, and they also carry the stigma of belonging to the FARC. 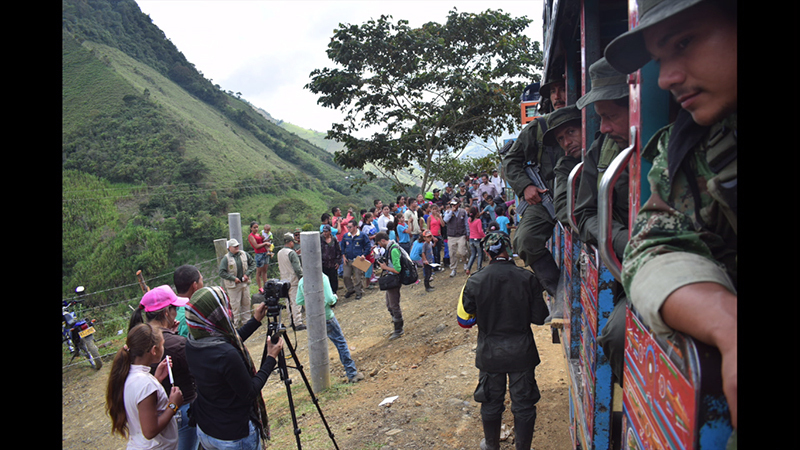 Ex-FARC members in a chiva (local bus) on their way to the vereda Santa Lucía, where they were about to give up their weapons and uniforms before entering the ETCR Román Ruiz. Photo credit: Communications team of the ETCR Román Ruiz. Temporary housing for the ex-combatants in the ETCR Román Ruiz. Photo credit: Communications team of the ETCR Román Ruiz. Ivo had made a preliminary visit to Santa Lucia in order to establish a working relationship with the ex-combatants and learn about their situation and needs. The difficulty of the journey was daunting, and Ivo was also unprepared for the rhythm of life in the ETCR. While the community was interested in being able to tell its story, members are busy with a multitude of tasks: cultivating the crops, taking care of the children of some of the ex-combatants, or cooking for the group. Nevertheless, Ivo had arranged to start a workshop intended to develop a small museum dedicated to exploring their memories through some of the objects that they still conserve. He would help them learn how to use the cameras and computers the government had bought at their request. I joined the game with a $500 peso bet; we were very focused on the second hand of Rompecoco. Daniel had picked up two aces from a straight, when we heard five loud shots no more than twenty meters from where we were with the door open. We ran immediately to take refuge behind the solid walls. We closed the door, waited four minutes and Sugey went out — I followed her, but we did not see anything, the street was completely empty, and the music kept playing. We moved forward and saw two feet hanging from the edge of the doorway of the closed pool hall. Marleny came running screaming, “It’s Rabbit’s brother!” Sugey immediately broke down in tears. They tried to call with the public telephone, but it did not work. Little by little people were approaching, looking from about eight meters away at the body lying face down. He moved a bit, was breathing with difficulty, and made some slight noises. The pool of blood was huge. There were shell casings on the floor. Several minutes passed before the military police arrived at the scene. Supposedly in a few minutes we should start the session in which they will bring the objects to begin the museum, but just in case — I hope that is not the case — I want to advise you about the situation, because I do not think people are very enthusiastic about this activity. Maybe we will have to postpone or suspend it according to how things go in the next few hours. At this moment I am writing to you in the only point where I can access Wi-Fi with my computer because my cell phone stopped working and it is not so easy for me to connect now. Tonight I will have more news. 13:17 They took to the road at once as they had been directed. I was last in that, in the march. But I was already free because I had the camera, and for me that was the most important work. 13:29 That one there, with the huge load, is Frankin. 13:33 He was followed by “Cabeza de Gato,” as we called him. Albeiro is his name. 13:39 And there’s the little Urías who was very small by the way, and was in charge of one, that very big rifle. Hehe. 13:46 There you see Doris going with her rifle in three parts. An AK47 with a tripod. 13:54 Here follows Tabares. Yes, his pack was very messy but… here we are going down. Exhibit of Ivo Aichenbaum’s and Jhon Martinez’s photo documentary at C3P. Photo credit: Fundación Casa Tres Patios. Ivo Aichenbaum and Jhon Martinez speaking to the public at C3P the day the documentary was first screened. Photo credit: Fundación Casa Tres Patios. During the post-screening discussion, Jhon volunteered to answer any questions that the public might have for him. Naturally, someone asked why he had joined the FARC. He explained how he had been raised in a small village that was caught in the middle of the conflict. He talked about how the paramilitaries would kill and brutalize villagers, but when the FARC arrived they would help them with road-building and other community projects. Most importantly, he described how they would treat the villagers with respect. When he was thirteen, he had decided to go with FARC, only to have his offer refused; they told them that he needed to take more time to think about it, and if he was still convinced when they returned, they would take him with them. His friends and family tried to discourage him, but he knew that his options were limited in the village, and he could be killed or forcibly recruited by the paramilitaries. When the guerrillas returned he told them that he was prepared to join them. Jhon’s simplicity and humility were inspiring. Many audience members commented on the importance of a story like this in educating them about the complexities of the conflict and helping them accept the ex-combatants as members of their community. 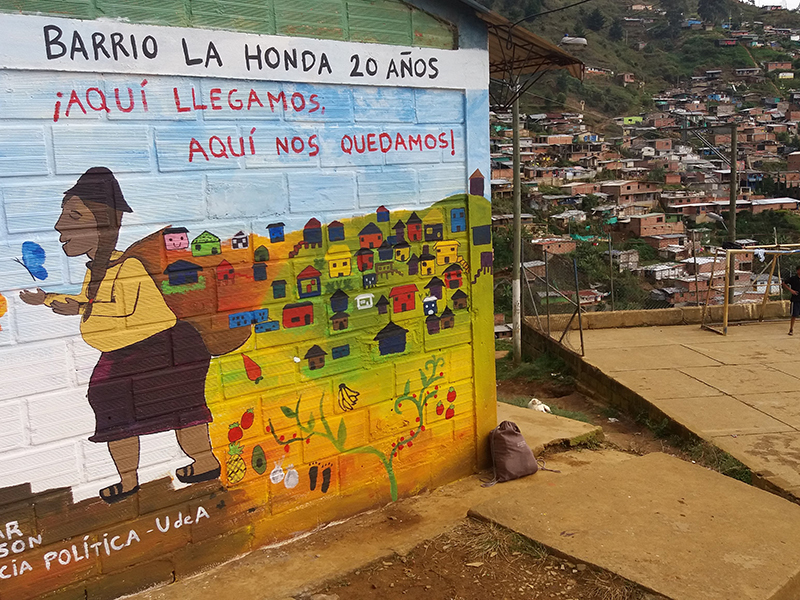 As the historian Mauricio Montoya noted during a recent seminar regarding the peace process conducted by C3P, one of the main reasons that the conflict began — and has lasted so long — is the lack of knowledge in urban areas regarding conditions in rural parts of Colombia. Seminar Urgent Questions: Causes, effects and possibilities of war and peace in Colombia with Mauricio Montoya, historian. 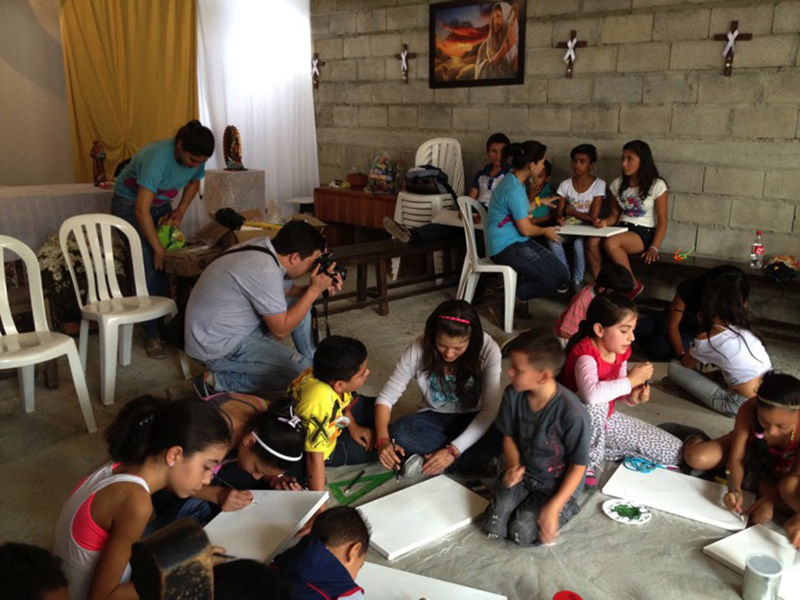 Photo credit: Fundación Casa Tres Patios. It has become clear to us that knowledge is the capital necessary for the peace process to work, and to construct a strong, viable community. 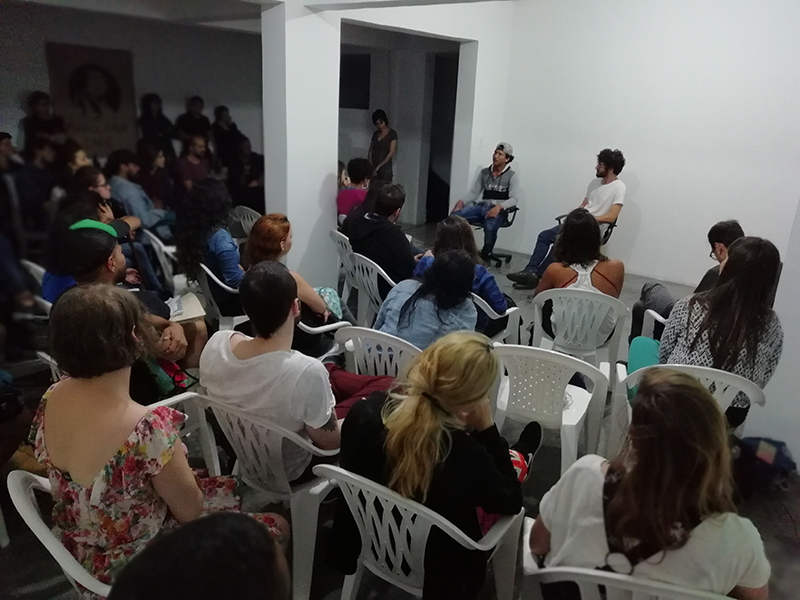 We must involve ex-combatants, farmers, researchers, artists, politicians, business leaders, and other organizations to construct new narratives, so that we can move forward with the processes of reconciliation that make real integration possible not only for the FARC, but for society in general. It is necessary to work in solidarity with organizations in other parts of the world: to make their struggles visible, to create a new sense of community that defies territorial borders, to resist the divisive forces that are becoming more and more prevalent in our world. From the 2010 movie Impunity, directed by Juan José Lozano and Hollman Morris; translation, Tony Evanko. AUC is the acronym for the main paramilitary group, Autodefensas Unidas de Colombia, or the United Self-Defense Forces of Colombia. Agencia EFE, “Raperos denuncian amenazas de muerte en Medellín.” El Espectador, 18 November 2012; translation, Tony Evanko. As its reforms evolved, the Ministry of Education developed objectives, including the creation of a working class capable of analyzing the current situation in the country in order to form ideas and solutions about moving the country forward. 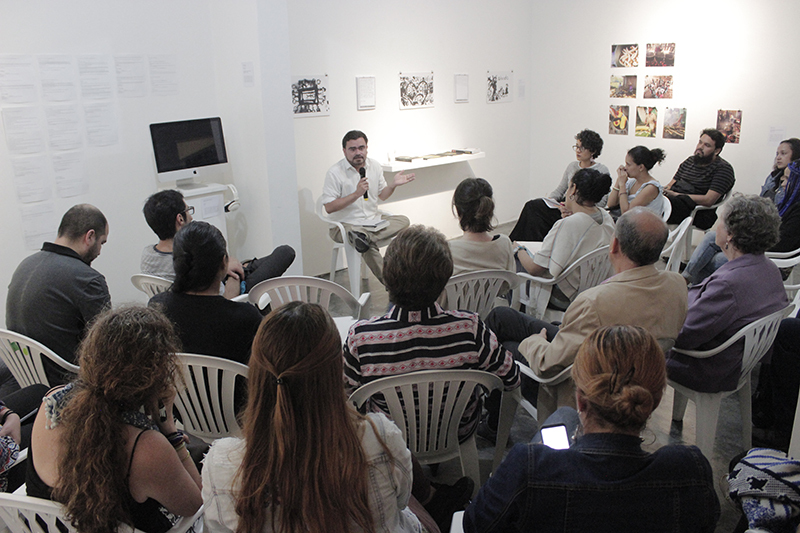 Paradoxically, an understanding of the past was not considered necessary in this process: a class titled History of Colombia and Civic Education was created instead of the original History of Colombia, and the number of hours per week dedicated to this mixed subject class was reduced from nine to six. Deibi is a Spanish phonetic transcription of the name Davy. The National Training Service (Servicio Nacional de Aprendizaje – SENA), is a public institution holding a legal status, with an independent capital structure and administrative autonomy, ascribed to the Ministry of Labor of Colombia. Taken from http://www.sena.edu.co/en-us/Pages/sena.aspx, December 7, 2018. C3P’s work is inspirational! So proud of you, Tony, and the people you work with, creating the space to educate, inspire and hopefully do some healing in the process!